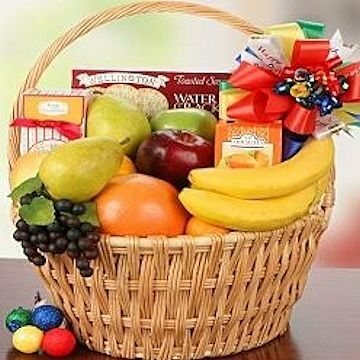 Let them know you're thinking of them on their birthday with this appealing gift basket filled with a variety of fruit. Some soothing tea, crackers, and cookies round out the selection. The classic basket, decorated for the occasion, is loaded with the finest local and tropical fruits available. Expect the assortment to include items such as pineapple, oranges, apples, kiwi, pears, and grapes. Cookies, tea, and cracker selection will be of the highest quality. Exact basket and fruit/gourmet selection may vary by season and delivery location. All Florist delivered products and containers may not be exactly as shown. In each case the individual florist may make substitutions of equal or greater value. For same day delivery, orders must be received by 12pm CST.